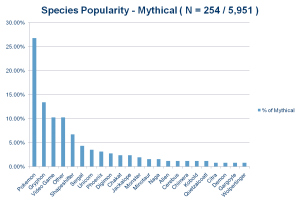 Creating a fursona is one of the most universal behaviours in the furry fandom.1 Defined as anthropomorphic animal representations of the self, furries interact with other members of the fandom through the use of these avatars, both in-person (e.g., badges at conventions) and online (e.g., profile pictures, forum handle). 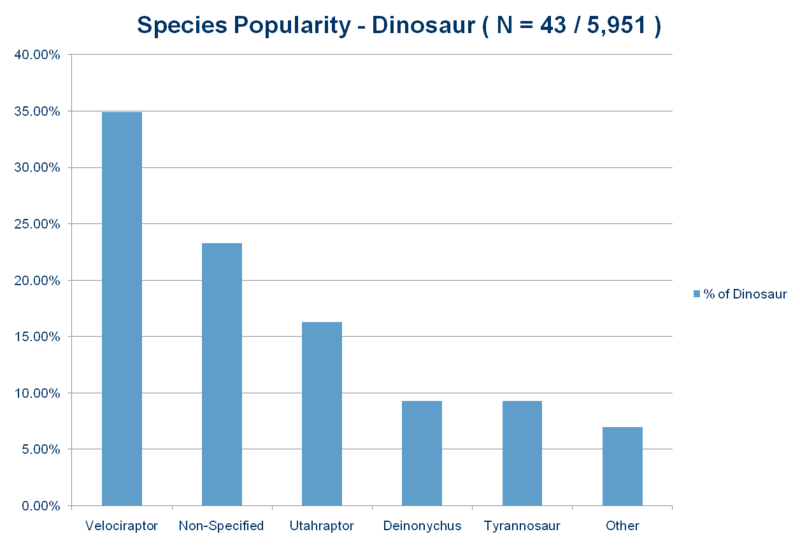 Fursonas can differ dramatically in the amount of detail they entail, and can include distinct personalities, histories, relationships, and attitudes. 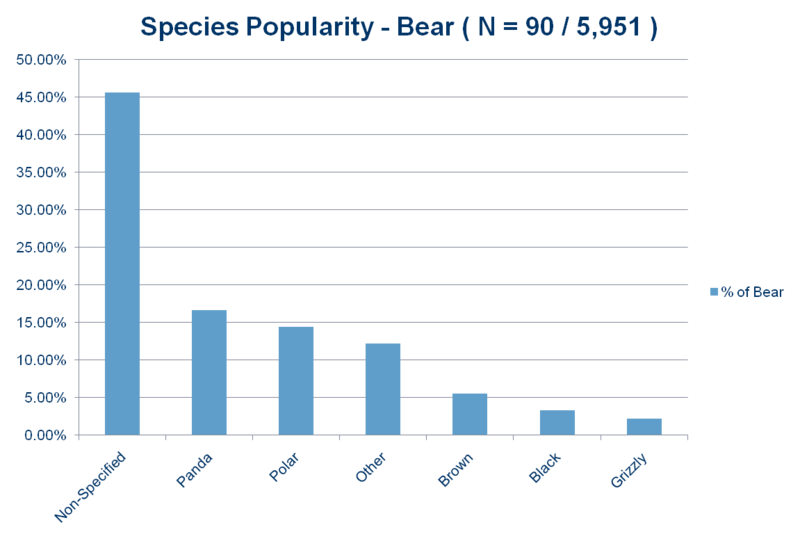 At very minimum, however, most fursonas include a name and a species. 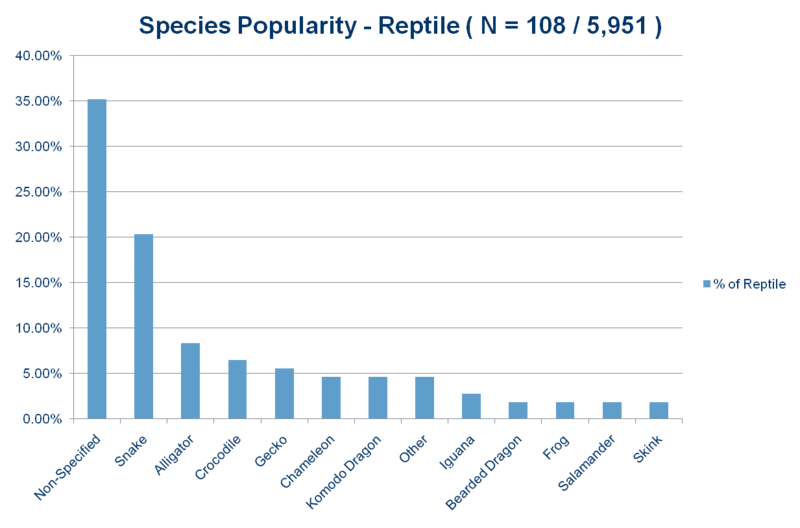 Many of the species listed were unique and, as such, cannot be presented in order to preserve the anonymity of our participants. 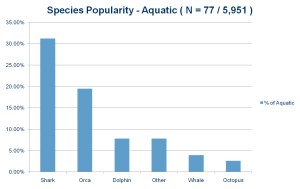 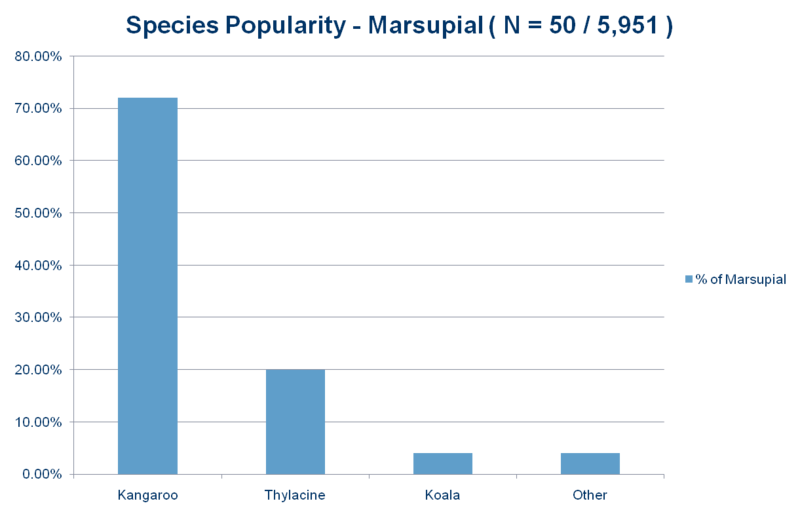 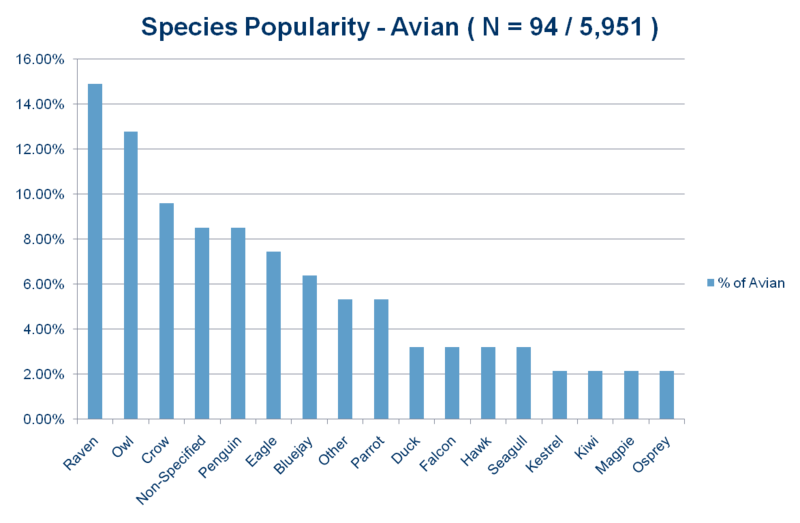 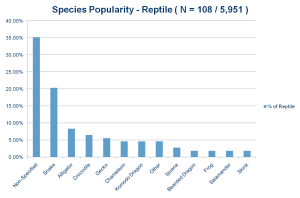 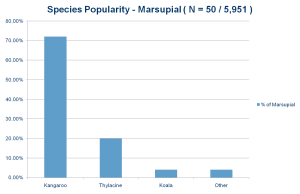 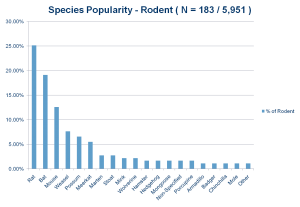 In the figures that follow, such species are aggregated in the “other” categories for the most relevant group. 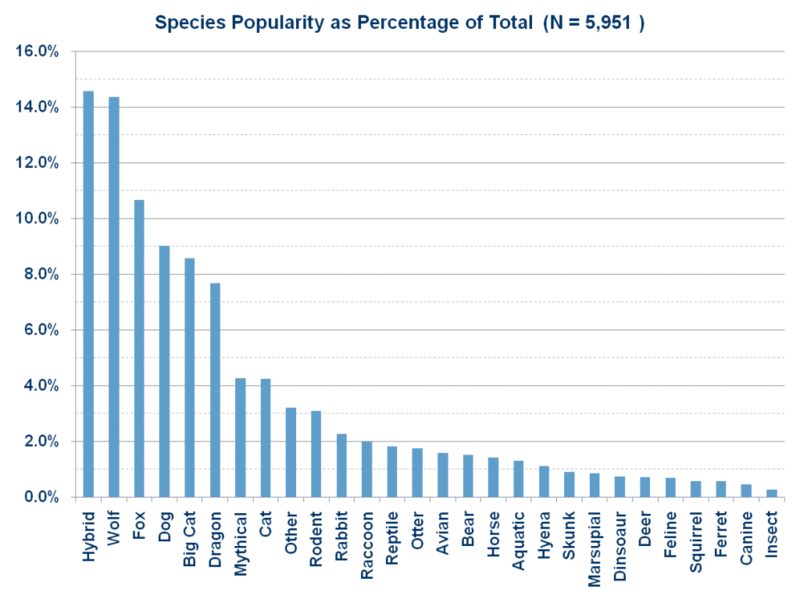 First, we present the data for all species. 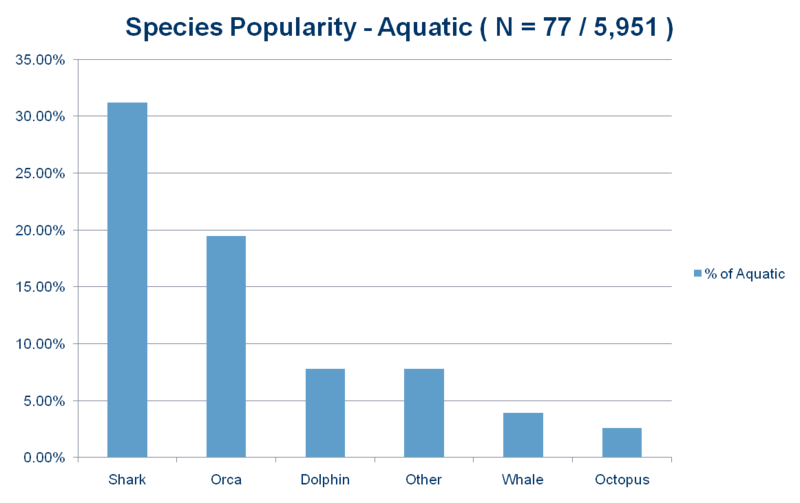 We then proceed with a group-by-group breakdown of popular categories. 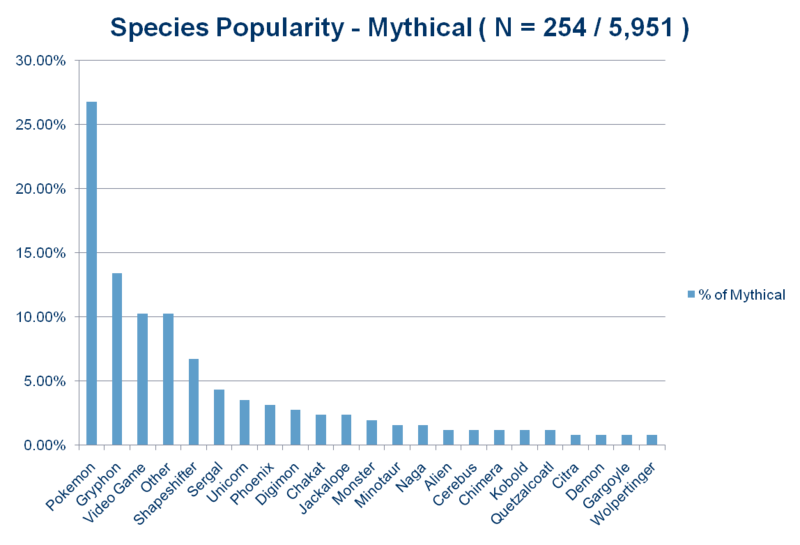 Within each category, “unspecified” means that the species was simply identified as the category (e.g., within the “wolf” category analysis, “unspecified” refers to people who just put “wolf” rather than any specific breed/type of wolf). 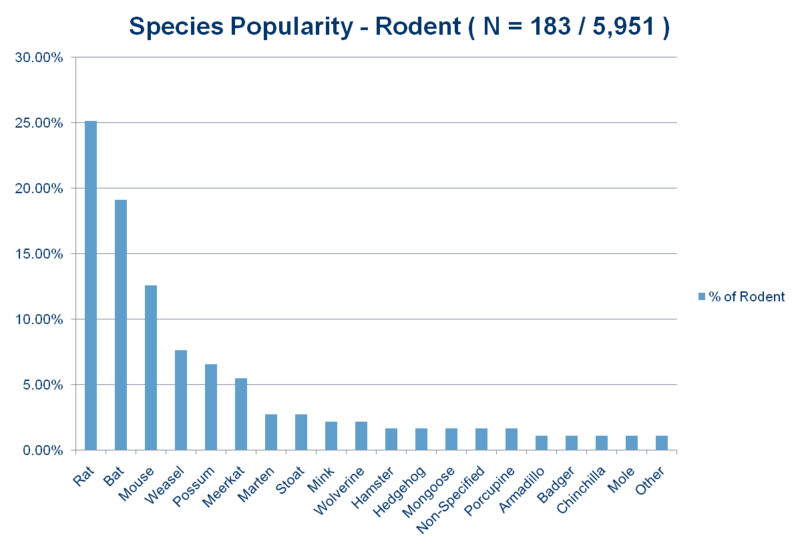 Please note that this category breakdown is not meant to reflect biological taxonomy or cladistics, but is instead meant to be a close approximation of how groups of similar species “clustered” together (e.g., the authors know that a wolverine and a badger are not “rodents,” but included them in with “small furry mammals” for ease of analysis). 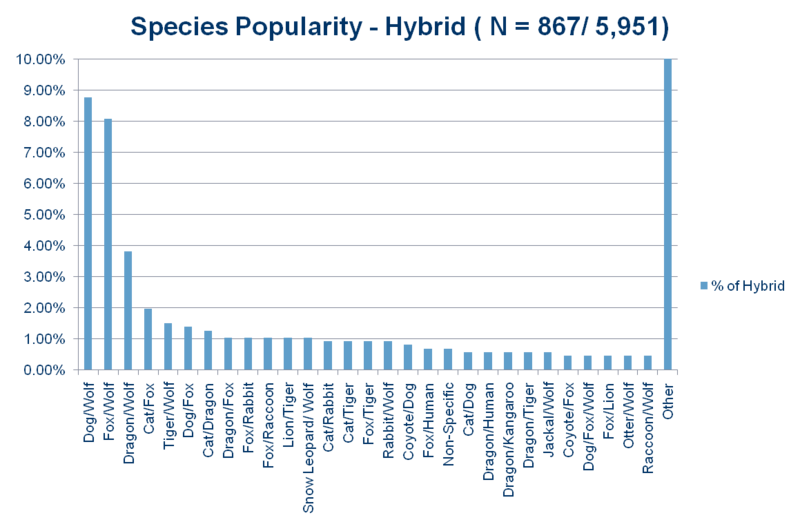 * Note that the “other” category here represents 52.1% of all the listed hybrids (and represent unique or exceptionally rare identified hybrids). 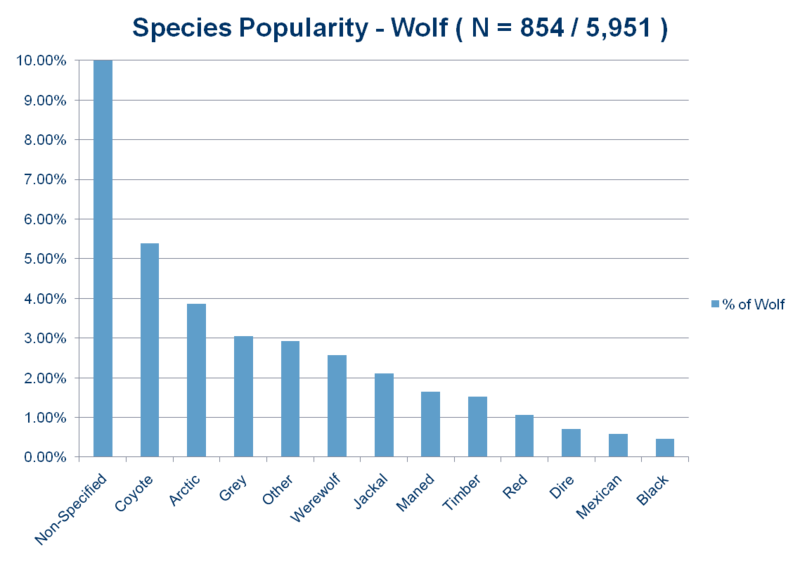 Note that the “non-specified” category here represents 74.1% of all wolves. 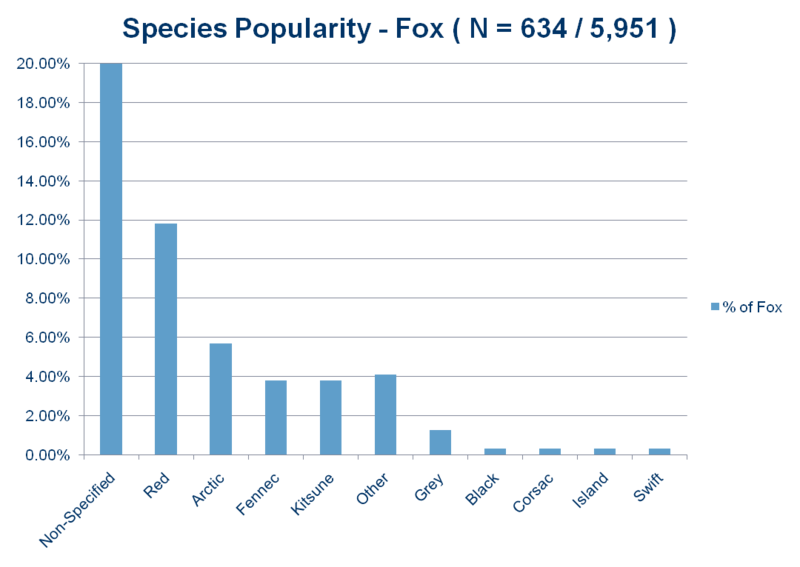 Note that the “non-specified” category here represents 68.3% of all foxes. 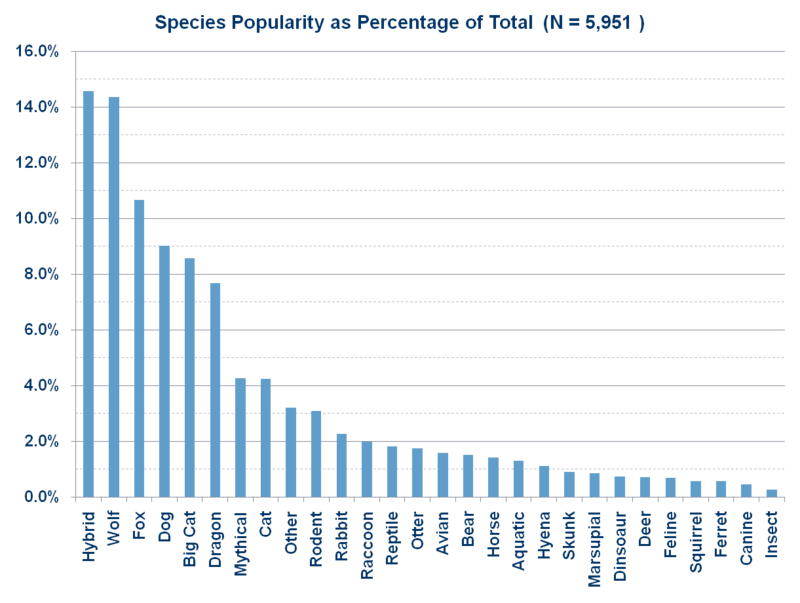 Note that the “non-specified” category here represents 37.5% of all dogs. 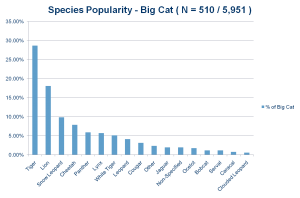 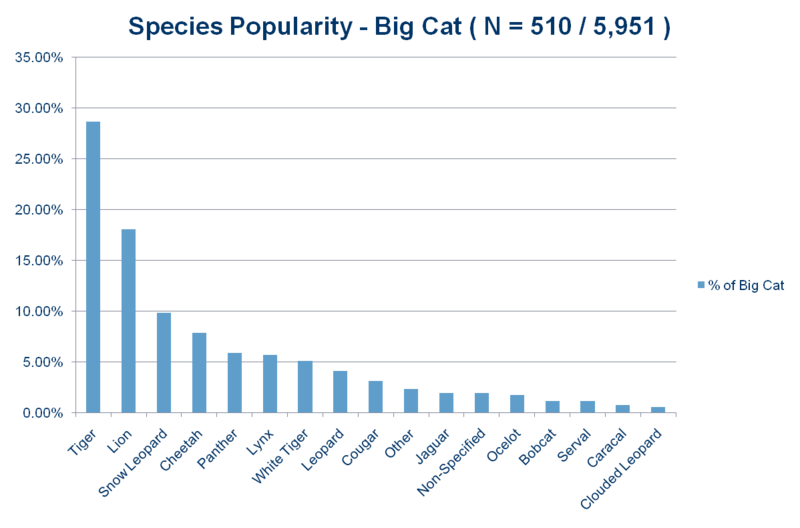 The authors recognize that many of these are not “big” cats so much as they are “wild” cats. 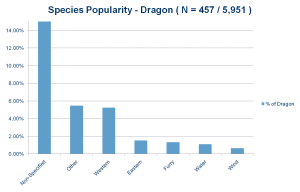 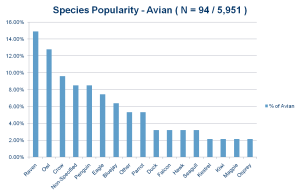 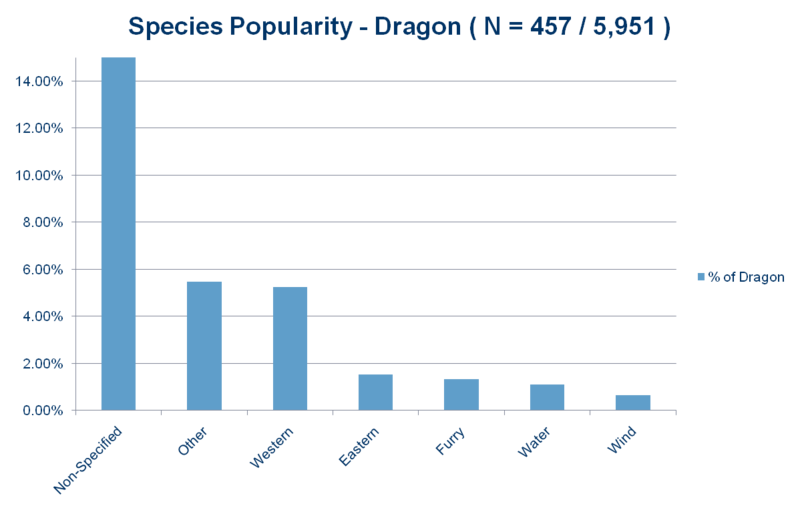 Note that the “non-specified” category here represents 84.7% of all dragons. Note that the “non-specified” category here represents 63% of all Pokémon. 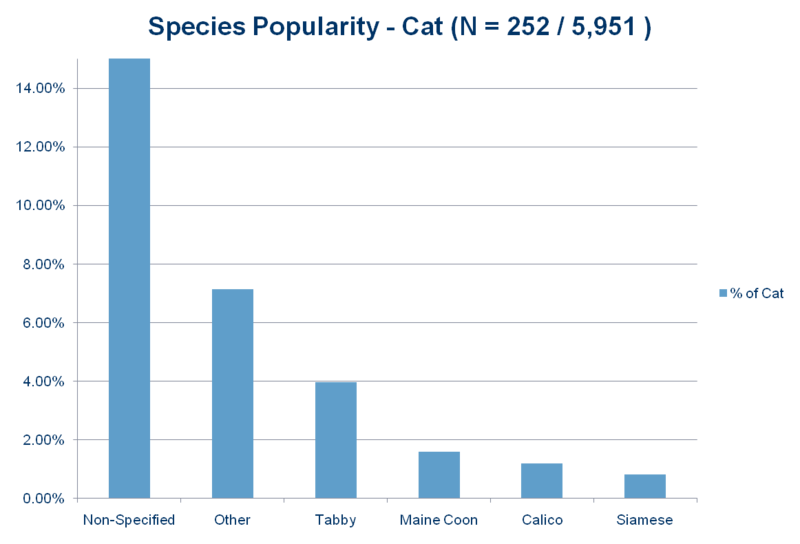 Note that the “non-specified” category here represents 85.3% of all cats. 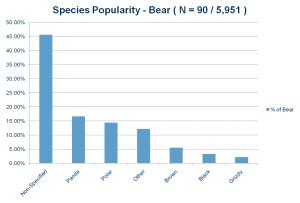 In addition to assessing the most popular species furries choose for their fursonas, recent studies have also begun to look at other aspects of fursona choice. 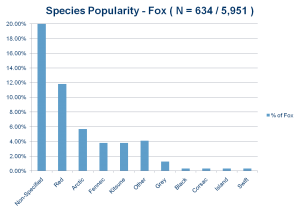 For example, one study recently looked at whether furries tend to choose fursonas that are more feral (look like an animal) or anthropomorphic (resemble a human).3 This question was asked as a 7-point scale ranging from 1 (Completely feral) to 7 (Completely Anthro). 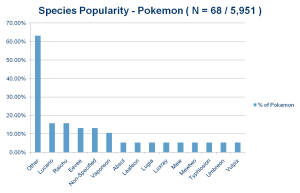 The results, posted below, reveal that the vast majority of furries create fursonas that are predominantly anthropomorphic. 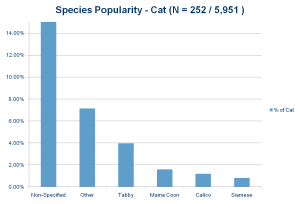 In the same study, we also tested whether there were predictable differences in the type of furry who chooses a more anthropomorphic/feral fursona. 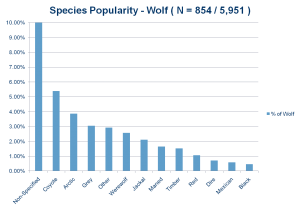 Results revealed very few differences: therians were more likely to adopt feral fursonas (and, in fact, many would not even consider it to be a “fursona” so much as the animal aspect of themselves), as were women. 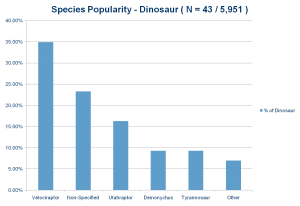 Factors that were unrelated to fursona anthropomorphism included age, extent to which one identifies as a furry, sexual orientation, years as a furry, owning a fursuit, and mental health.